In the splendid colour photo above, did you see the K9? A Scammell Explorer too, poorly VOR'd armoured vehicles awaiting attention and two Bedford RLs, one of which appears to be a REME winch truck. What struck me too, was that the cabs of the RLs 'appear' to be a different colour to their bodies, or a different shade of Light Stone. Is it me? Well, to quote Sean "No one has bitten', I shall say the same about those ghibli-battered frame tent shelters that served as the REME workshops for 2RTR LAD in Wavell Barracks, Benghazi. I'm not though, able to tell you what the correct nomenclature/designation/name was for those structures (prior to damage :-))? Does anyone know? I hope they do and posts the answer so we can get out of Cyrenaica and back into Tripolitania District. To further aid you, a photo by John Empson REME. No idea about the name in the 50s-60s but in the 90s a similar structure was called a RUBB Shelter. 3 of them are visible on Google maps on the SW side of the runway. The 4th looks like it is being dismantled. These workshop shelters were known as the 'Aldershot shelter', or to give it the official title, Mobile Workshop Shelter Type A, Aldershot Pattern. According to official sources, the Aldershot was 40 foot wide and 38 foot long with height to top ridge of 18 foot. Framework weighed 2,600lbs and canvas was 1,000lbs. It took 40 men 90 mins to erect. Richard have you got any pictures? In what era did you come across them? The extract I posted is from the SCRDE Colchester 1973 catalogue. There is a slightly longer thing, a Shelter Portable No.33 but does not quite match Lizzie's picture, the SP No.2 seems to tie in with the features quite well I thought. The Aldershot shelter was used in WW2, may pre-date it to. It is detailed in one of the red War Office books on REME, which relates experience gained in wartime. Detailed drawing in it, framework fits the Libya one to a T.
Thank you Richard and Clive. Now we all know. 'Aldershot' it is. I think perhaps you'd have been hard-pressed to find 40 'willing' pairs of REME hands to put the things up 'quickly'! They'd of had to 'rope' in the squadron troops too, methinks especially as I know that when Ajax 2RTR, as a lone squadron, first was stationed in D'Aosta Barracks where the 'Aldershots' had to be errected, the squadron LAD was a lot less than 40 strong, i.e, just a 'Fitter's Section'. Maybe the 'Aldershots' had already been erected prior to their arrival, perhaps by 'barrack services' (joke!) or was there a previous unit that had vacated? Aldershot. Home of the British Army. How appropriate for a shelter (home) name in the desert. I can certainly see the likeness to the Aldershot & for those who don't have the REME book I attach a scan. 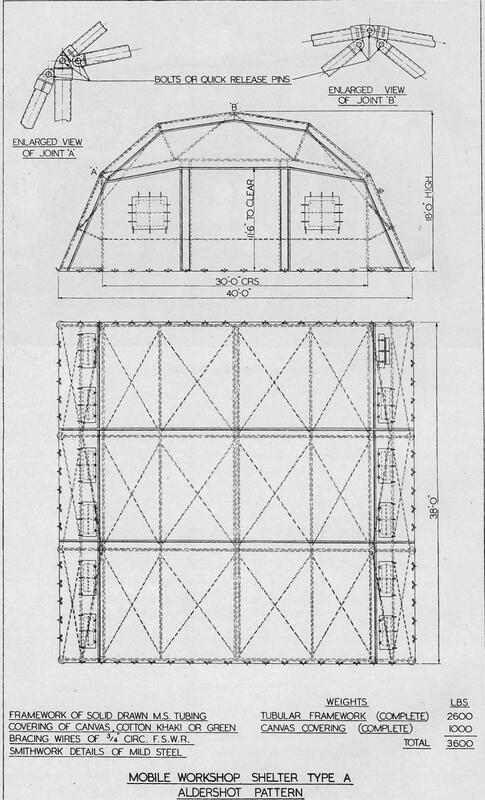 The diagram shows no windows in the next upper sections yet windows are present on the Libyan ones & SP No.2. The diagram shows a window either side of the entrance, but on both the Libyan ones & SP No.2 there seem to be no such windows. It may be too small a detail to record on the diagram but there are no roof ventilators, although quite basic diagrams of wartime large tents & marquees show them. Difficult to see but some are just discernible of the Libyan ones & SP No.2. 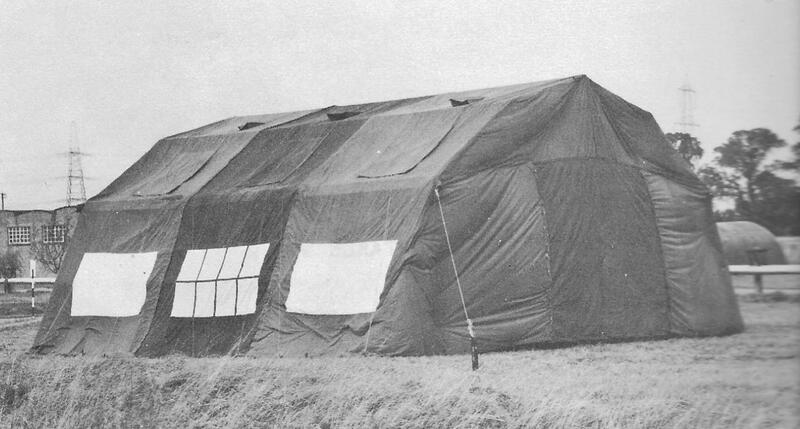 Although my picture of Shelter Portable No.2 comes from a 1973 publication it doesn't preclude it from being wartime as the book includes some wartime marquees. I note that the REME wartime book includes SP No.4, so it seems feasible that SP No.2 might have been around back then. I don't think it can be BC as 43 BC 71 - 99 BC 99 was not used. BG makes more sense & would make it a signals truck which makes the basic vehicle Bridge Class 4, but some fitted with certain installations were Bridge Class 5. So are they different vehicles or has it changed the type of radio installation between photos? I did say we were going to get back to Tripolitania after the Aldershot shelters in Cyrenaica but I just couldn't resist another one from 'there' and this time, its a K9 again! Notice its an FFW and it has a Bridge Class 7. Oh. Nor am I going to pretend that the G in the VRN is really a C and I'm not going to show you another (as two colour photos of it, front and rear appear earlier in this thread) with both C and G in the VRN (no wonder I'm confused), and, I'm not going to show you another Tripolitania District K9 which may or may not be FFW with a ..... Bridge Class 9 :shocked:. It was Libya, afterall. So its not the 'Aldershot' after all!!! I rather liked the shelter being that, but now we know the shelter is actually the Shelter Portable No.2. Does the Shelter Portable No.2 have a more 'familiar' 'handle'? Can we see the scale drawing for that 'Aldershot' too, please? The Shelter Portable No.2. Can we see the scale drawing for that 'Aldershot' too, please? Lizzie the overview for SP No.2 comes from a catalogue of Tents & Shelters in Service & Under Development unfortunately it is not detailed as would be in a User Handbook. There are no scale drawings, I'm not aware of any term of familiarity for it. I've looked in RAOS Part 8 Pam No.44 Handbook of Tentage 1946. Although it contains shelters they are only small specialist ones, the only large forms of tentage are marquees of their various kinds. Twenty years ago I bought direct from the MOD all user handbooks available for all tentage in service. The publications were all dated 1981, it doesn't include the Aldershot or SP No.2 but surprisingly still includes the various WW2 marquees. PS I forgot that I also have a separate book with the data summaries of all tentage in service in 1981 which amounted to about 50 types including SP No.2 but not the Aldershot. Although there is Shelter, Portable, Universal, Assembly 'A' it is nothing like the Aldershot. The UHBs I bought were just the ones held at the DSDC at the time, these do have line drawings but these are not included in the data book JSP 361. 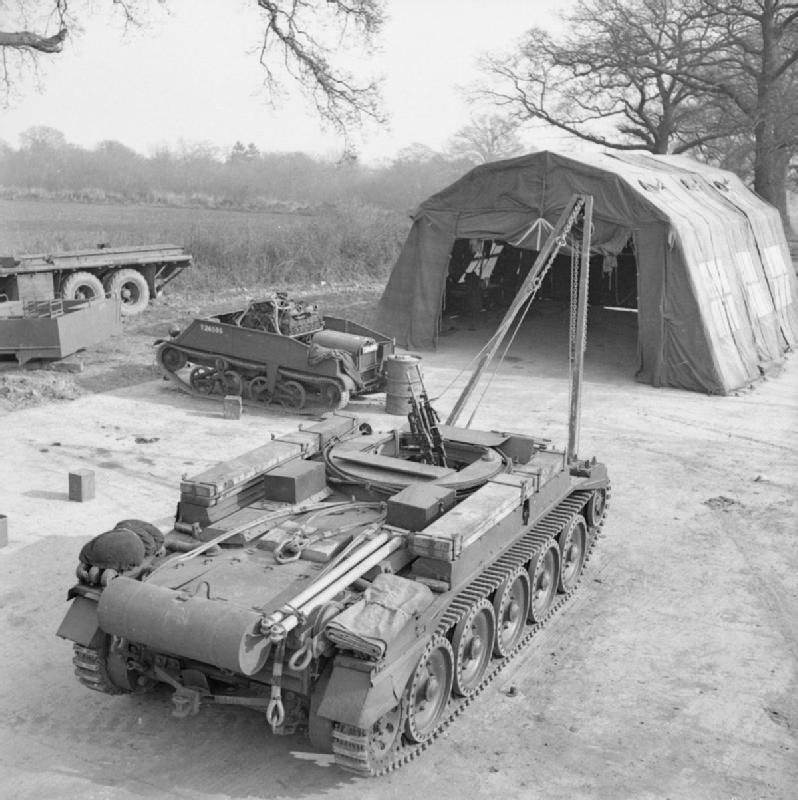 Here is a photo of an Aldershot shelter being used as a workshop during WW2, of interest is a Loyd Carrier, with what looks like a tank engine sitting in it, I wonder if this was trailed behind the Crusader ARV? (off subject, sorry Lizzie). Anyway point of photo is to show these structures did have roof vents. It's a bit fuzzy but I am pretty sure that that is a Churchill engine sitting in the Loyd. No wonder it is sitting a bit low. Lovely photo of the Crusader ARV. Richard, is that not actually a Shelter Portable No.2? Looking at the side windows there is a single large window in each of the three sections, whereas the Aldershot in the REME diagram shows two smaller windows per section? I read in that WO book on REME activities during WW2 that the 'Aldershot' shelter was developed before the War and it also mentions 'for the 30ft span model'. This makes me wonder if it came in different sizes, and also what we do not know, is the origin of the detailed drawing of one in that book. One can only draw conclusions that the structure evolved over time, with alterations to the canvas covering to make it more practical, ie. vents and different window apertures. Photos from known dates are best reference I think. As to whether it is a No.2, I have no tentage references to draw on. But, as I think the framework on the Libyan one appears similar/same as WW2 versions, it is highly likely the generic name given by soldiers at the time, may well have been 'Aldershot' although it may not have been the official one. no problem, I did not notice you post had been withdrawn until after I posted. We certainly learn lots here, don't we? Of course we do, all good stuff as far as I'm concerned. Now, we're back in Tripoli, Tripolitania where 10 Armd Div Ord Fd Pk had been formed from the smaller 25 Armd Bde Ord Fd Pk, which, if I'm not misinterpreting the records, had existed in cadre form as part of the parent unit, 595 Ord Depot RAOC Kassala Bks (Mareth Bks pre-1955). The Ord Fd Pk seems to have been located in some other barracks and not with 595 Ord Depot. Could have been they were at Gurgi which seems most likely as the 595 Ord Veh Park were there, sharing 'the land' (a very basic 'barracks' with supposedly, no accommodation blocks though plenty of .... TENTS!) with 19 Armd Wksp REME and 5 Medium Wksp REME. RAOC Journals are so vague and provide no barrack names for units but they do tell you what the football score was having played against some other unit! Paff! So, here's the some of the unit lined up in 1956, with their warpaint on (H) ready to go to somewhere they were not allowed to go to after all. Oh, look at all them RL Binners, and even Hippos! Some vehicles do not display the 97 on the RAOC arm of service flash which makes me think those were issued from the main Ord or Veh depot to bolster the Ord Fd Pk (97) vehicle numbers. What purpose the rectangular concrete arches serve is beyond me, though there are two b&w signs visible with the closest saying 'Receipts'. Perhaps the other says 'Issues' though I'm told that as stores were for storing, there were never any issues! Can you see a caged Hippo? I can. A Moggie too! Let's take a closer view of the caged Hippo. I bet that like myself, you've never ever seen a Hippo thus caged! Was the steel mesh called Dexion XPM? Maybe. Why was the Hippo caged and not the others? Could it be to protect high-value or attractive items from pilfering, after all, the Hippo was in the Land of Pilfer? If so, why mesh up the cab too? Or, could it be that this Hippo was a returnee from that other Land of Pilfer across the eastern border, the place where British Forces were told in no uncertain terms to get out of? Possibly, though I do not know if Hippos over there were caged at all, not even to prevent hurled rocks and other projectiles from breaking windscreens and harming soldiers. I can see though that this Hippo at one time had a different Divisional flash with a shortened top unit name bar, judging by what is underneath the standing Rhino. Or, maybe it has just been specially meshed-up to go to the H war for some reason, and for the answer, we might need an ancient RAOC Vehicle Specialist to supply the answer? Anyone? The RAOC online forum all play doggo when I ask a question. This Hippo looks good though! Oh, its got little twinned rear wheels so that makes it a Hippo Mk2 .... er, I've forgotten if its A or B! Were the rear wheels smaller than the front ones? I have it all somewhere, but not easy to hand right now. Photo copyright EJT (me :laugh:). Just a little bit closer again because the photos you see are not enlarging as sometimes they seem to not want to thus denying us 'full view enlightenment', Grrrr! It looks as though the canvas tilt shrunk in a rain storm. Hey! Even the tilt on the Hippo next door has shrunk! Maybe they're not Hippo tilts at all? This splendid photo is a gem and you can see all that I've mentioned far better. Hello Wally, thanks for chipping in on the service registrations, I hoped you would. Point taken on the issue of large numbers of registrations, we have talked about that before and I'd temporarily forgotten. Having said that, there's still a conundrum there in the metal if not in the registrations. Where large batches of registrations were issued - for example BG registrations for that first batch of K9s - were there ever circumstances where registrations were issued out of sequence, i.e. an earlier truck could get a later registration or vice-versa? Wrecking bonnets? Lifting bonnets? No, take the bonnet off and sling it in the cargo body with the two spare tyres and the two camels who will be nonplussed! I suspect this K9 may have been abandoned? There looks to be a poorly Landrover too? Not too sure about the VRN on this one either! It does though begin with an L for Libya, doesn't it? The stripe markings on the truck tail mean what, I wonder? Would you carry camels in your K9? What a great photo. The bonnet isn't even slung in the cargo body, just wedged between the cab and tilt frame - which looks as though it's suffered an attack of your healing brush at the rear offside ;-) ! Difficult to know whether the K9 is abandoned or not. If abandoned, why are the camels in it - would they really have climbed aboard to find somewhere to sit? On the other hand, if it isn't abandoned, why is the bonnet - or a spare - just chucked behind the cab like that. Certainly looks like a civilian Libyan registration and appears to be in Arabic and Roman lettering? In the splendid colour photo above, did you see the K9? ... What struck me too, was that the cabs of the RLs 'appear' to be a different colour to their bodies, or a different shade of Light Stone. Is it me? Didn't see the K9, unless it's the vehicle rear end just visible at the entrance to one of the further tents. The bowser partly out of shot to the right could be, I suppose, but it doesn't look K9. There's what looks to be one of those single axle generator trailers behind the furthest tent as well. 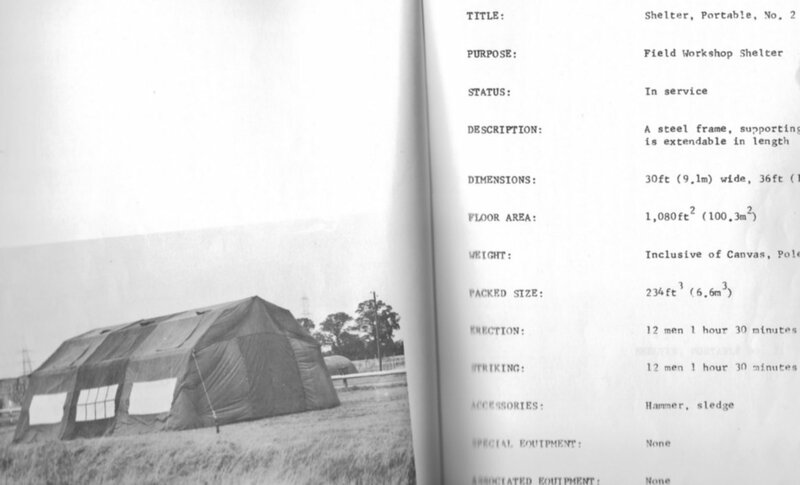 To the Aldershot question, I'd be inclined to agree that 'Aldershot' is likely to have been a generic nickname applied to all portable shelters of that design irrespective of size. I fancy the ones Lizzie originally asked about are the 40' x 38' x 18' ones Richard suggested, though - using the truck and Ferret rear ends visible in the entrances to the shelters for scale puts them at around that size, certainly bigger than the dimensions Clive gives for SP2. Having said that, the one in the ARV image looks significantly smaller relative to the vehicles and scenery, so I wonder if that one is actually SP2? You could see that a stores lorry - an improvised binner - might have a Dexion structure like that in the rear, but the only reason I can think of for covering a truck cab like that is riot protection, or certainly protection against attack by those who might want to steal what's in the rear, unless Clive or Richard can think of other circumstances in which that's been done? My guess is the apparently shrinking tilts are in fact because the structures in the rear are a lot taller than a standard Hippo tilt frame, which aren't particularly tall. If I remember correctly the generic name for that sort of mesh is Expamet, a contraction of EXPanded METal, and I guess originally a trade name; so XPM for the Dexion version would fit. Thanks Sean, especially for your Hippo comments. I had forgotten too that in the run up to Suez, and as on several much earlier occasions, the Libyan Arabs were revolting to some degree against the British (and against the Libyan Jews of whom many were murdered in what's referred to as the Tripoli pogrom) to the extent that British dependents were evacuated from their MQs and hirings into army barracks and thence by fleets of aircraft back to the UK. Dependents all came back early in 1957 after Britain's, France's and Israel's defeat at Suez. Vehicles may have been protected with XPM mesh in Tripoli as I do have accounts of rocks being thrown at British Army trucks and buses where windscreens and windows were smashed. No other photos though. the Libyan Arabs were revolting. There's a very old joke there somewhere. So let's have a look at another sand-coloured little delight over at 10 Armd Div Ord Fd Pk somewhere south of Tripoli in 1956. Yes, an MRA1. Oh, I get to use the 'maneuverers' word again though I think they may be lost as 'consultations' are in effect with the, go on, dare me to say it, go on ...... the monkeys! Yes, the divisional Military Police are there with their Landrover. I have no more information about the photo unless I make it up and we don't want that, do we. Notice warpaint (H) is worn and the MRA1 has run hot unless the nose side panel has dropped off somewhere. What is that stick thingy on the bumper of the MRA1? Maybe a convoy flag flagpole? A local modification perhaps as I've not seen this on one of these trucks previously.